Certainly not resembling other seeded fruits with a rounded shape, banana plants produce fruits of an elongated, interesting shape. Moreover, sweet-fleshed types are known as bananas while those with starchy, less sweet flesh are considered plantains--however both come from the same group of plants. These fruits develop in large clusters called hands and point upward on the stalk that dangles from the mother plant. In the end, realize that a banana fruit is botanically considered a type of berry. From the tip of the banana plant shoots a long pendent stalk that is lined with flowers, called an inflorescence. The large purplish flower bud first display five to 15 rows of strictly female-gendered flowers that are yellow-white in color and tubular. Depending on the plant genes (variety of banana), the number of whorled rows of these female flowers will develop into banana fruits without pollination. When fruits form without pollination, it is considered an example of parthenocarpy. Other fruits like apples, mangoes, cherries and peaches require pollination to lead to fruit creation. According to the California Rare Fruit Growers website, the banana plants inflorescence elongates to then reveal sterile flowers with both useless male and female flower organs and finally flowers that are entirely male. Banana fruits do not form in either of these areas on the inflorescence and simply shrivel-up and fall away. The banana fruit results from the swelling of each female flower's ovary wall. This makes a banana officially a berry. The ovary of a banana flower is located below the point of attachment of the flower petals, making it an "inferior ovary" in position. Because the lower stem base of the flower (the receptacle) houses the inferior ovary, they mutually swell to become the fruit. Officially a banana is regarded as an accessory berry according to authors of the textbook "Economic Botany: Plants in Our World." Banana fruits are soft, fleshy and full of liquid tissues and are regarded as "fleshy fruits." This is another characteristic of a berry and is the opposite of a "dry" like a nut, grain, capsule, legume, achene or samara fruit. The receptacle of the flower becomes the banana fruit's skin while the compartments of the ovary (ovules) swell with tissues replete with starches and sugars to form the tasty core. Since the female flowers develop into fruits without pollination, there are no seeds in modern banana varieties. 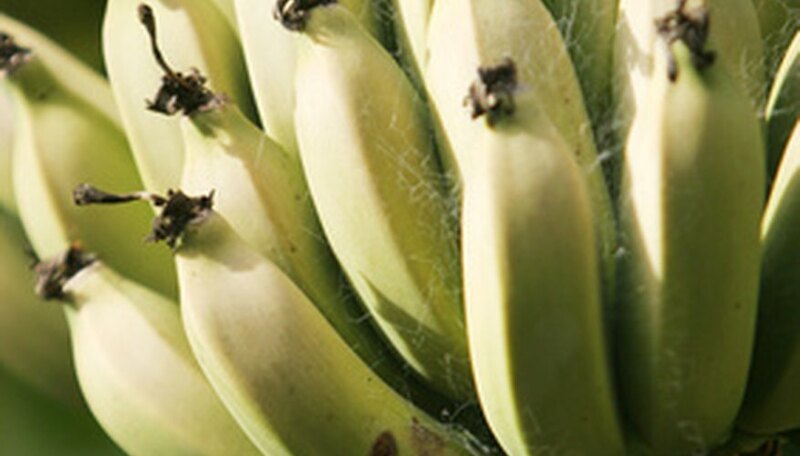 The brown specks encountered in banana flesh are the dried, shriveled remnants of aborted ovary compartments (ovules) according to the California Rare Fruit Growers. In ancient times, the wild species of bananas across tropical Southern Asia produced fruits with viable seeds in their flesh. Although this can occur today, centuries of genetic manipulation by man to grow larger-sized fruits or banana plants that are more resistant to diseases and pests renders the vast majority of modern bananas as seedless. In fact, different genetic codes from various bananas are fused together to create diploid (2n), triploid (3n), tetraploid (4n) and other polyploid-type bananas that have multiple sets of chromosomes. In a simplification of information from "Economic Botany: Plants in Our World," extra chromosome sets often prevent seed formation as the codes do not match perfectly and merely lead to larger-sized fruits with varying flesh colors and flavors.